THE AMATEUR PERFORMANCE OF THE CENTURY: Not since 1999 have so many amateurs made the cut at the Masters. Four men got through Friday’s cut to 65 players and Viktor Hovland, winner of the Silver Cup as the low amateur (3 under) for 72 holes, was the first amateur to finish under par since 2011. Alvaro Ortiz, the second-low amateur, was also under par. Hovland is also the first player from Norway to play the Masters. He beamed beside Tiger Woods in the day-ending ceremony in Butler cabin. Behind Hovland, Ortiz was the only player in the field from Mexico, and the first Mexican to player the Masters in 40 years. Takumi Kanaya, from Japan, followed in countryman Hideki Matsuyama’s footsteps, gaining an invitation by winning the Asia-Pacific Amateur last fall. “Now it’s truly a global sport, and you’re seeing kids that are better, younger, at a much earlier age than before,” Masters champion Tiger Woods said when asked what he thought about the amateur performance. WHAT WILL HE DO NEXT? In the immediate future, Hovland is headed back to Stillwater, Okla., to finish the college season. Postseason awaits, starting with the Big 12 Championship later this month, and a very important carrot dangles in the distance. “Grind it out and try to get the repeat at nationals,” Hovland said of the next goal. Before he played the Masters this week, Hovland had made three PGA Tour starts since winning the U.S. Amateur in August. He’ll also play the U.S. Open this summer. Those are the perks that come with winning the U.S. Amateur. Time will tell whether Hovland returns for his senior season with the Cowboys, but he learned an important lesson at Augusta National. “I'm pretty happy with my performance, just making the cut and showing that I can play out here,” he said. “I belong, I feel like. THE ANWA HAD LEGS CLEAR INTO MASTERS WEEK Before the first official shot went in the air for the Masters, Jennifer Kupcho and Maria Fassi’s back-nine duel at the Augusta National Women’s Amateur was fresh on everyone’s mind. Remarkably, highlights were still rolling well into the week. Major winners mentioned ANWA players by name in their pre-tournament press conferences. Women also starred in weekend ad spots during Masters coverage. "Both of us just wanted to send the message that golf is about having friends...we were cheering each other on, and that's kind of how golf is supposed to be." The ANWA was much more than a tournament. It was a women’s golf movement in the middle of Masters season. Initially, the timing of the event was painted as a poor decision – it overlapped the first major of the LPGA season, it allowed for only one competitive round at Augusta National in order to protect course conditions for the Masters – but in retrospect, the timing seems to have some undeniable benefits as well. National media reported and commented en masse. “I think this tournament got so much coverage that everyone wants to play here, and there's no bigger stage than this for amateur golf,” Kupcho said. RIDLEY’S LAST WORD: Saturday’s final-round heroics at the ANWA said a lot for the success of the event. It would have been hard to script that day any better. But from inside Augusta National, there was another ANWA sentiment – one that Chairman Fred Ridley said, in his Masters-week remarks, he didn’t quite see coming. CRASH COURSE IN AUGUSTA NATIONAL: On Saturday at the Augusta National Women’s Amateur, South Carolina head coach Kalen Anderson was noticeable primarily for the ponytail sticking out the back of her green Augusta National hat. Female caddies are a rare site here, but Anderson did her homework on the course – right up until the last minute. In fact, Anderson was nearly late to the first tee for her player Ainhoa Olarra, the reigning SEC champion who graduated last year and took a job with Deloitte in Madrid, Spain. Olarra is a friend of Franceso Molinari’s caddie Pello Iguaran – the two know each other from Olarra’s home club back in Spain. So Olarra introduced Anderson to Iguaran for a few words of advice. Anderson had also picked a local caddie’s brain during the practice round. Each player, whether she took a local caddie for the final round or not, was paired with one during the practice round. Anderson took the opportunity to go over potential hole locations and likely scenarios. 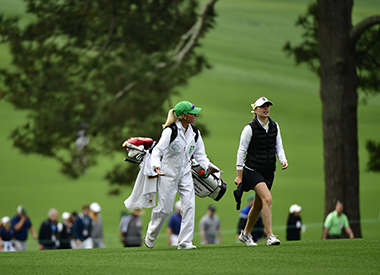 Anderson, who likened her caddie gig to what she normally does when coaching players on-course during college play, was most surprised by how extreme the elevation changers were at Augusta. That’s a popular sentiment. She found the short putts – even the 3-footers – to be as difficult to read as anything. After making the cut on the number – and squeaking through an 11-for-10 playoff with the last spot – Olarra finished T-12. She posted 1-under 71 at Augusta National. EXACTLY HOW MANY PEOPLE WERE WATCHING? : Much was made of how many more eyes would be on women’s amateur golf thanks to the platform that Augusta National provides. Well, the numbers are in. Saturday’s three-hour NBC broadcast of the Augusta National Women’s Amateur ranked as the most-watched amateur-golf telecast – men’s or women’s – in 16 years. According to the Nielsen Company, the final round of the ANWA had a .96 Overnight Rating, better than the 1.36 Overnight Rating that the U.S. Amateur broadcast drew in 2003. That was the year that Nick Flanagan defeated Casey Wittenburg in 36 holes. The skinny: Played on an Alister Mackenzie design (Mackenzie also designed Augusta National) and with a letterman’s jacket awaiting the winner, the Western really is the Masters of college golf. It’s also the longest-running tournament west of the Mississippi river, and this year it will be televised on Golf Channel. The skinny: The end of April is about crowning conference champions. Some of the bigger conferences will do that in the following week, namely the SEC women, Big 12 women and Pac-12 women. For smaller conferences, the Automatic Qualifying spot into NCAA Regionals that comes with a league title is a huge opportunity. But never forget that just because it’s April doesn’t mean that conference weather is a breeze. The MVC Women’s Golf Championship will now begin on Monday, April 15 due to ❄️ tomorrow. Ladies w local caddies averaged 71.1.